Instructions – How To Tile With Mexican Hand Made Tiles. Read the instruction on the adhesive and grout packets before tiling. 1. Prepare the surface you are going to tile onto so it’s sound and flat. 2. Plan the layout of your tiles and decide on a starting point. 3. Use adhesives appropriate to the surface you are tiling onto. 4. Decide on the spacing of the tiles, usually between 3 to 5mm. 5. Space tiles using spacers used at tile centers not corners. 6. Apply adhesive to wall using a notched trowel. Add a knob of adhesive to the back of the tile. 7. Put the tile onto the wall using sufficient pressure so that the ridges left by the notched trowel are flattened. 8. Mix grout to a creamy consistency and press into the joints using a rubber grout float. 9. Sponge off excess grout before it fully sets. This is intended to be a rough guide for tiling. For more specific information please contact us by email or telephone 020 7613 0876. We will be glad to answer any of your questions. 1. What is the finish on the Mexican handmade wall tiles, matt or gloss? 2. Are the handmade tiles suitable for outside? 3. Are the tiles suitable for using behind a cooker or a fireplace surround? 4. Can the tiles be used in bathrooms, showers or kitchens? 5. Are the handmade tiles suitable to use on the floor? 6. What do you mean the tiles have a crackle? 7. What colours does the grout come in and where can I buy it? 8. What grout would you recommend? 9. What are the differences between laying industrial tiles and handmade tiles? 10. How do I work out a random pattern for laying my Mexican tiles? 11. Why are different coloured Mexican tiles different prices? 12. Can I collect the tiles? 13. Do you stock Mexican decorative handmade glazed terracotta wall tiles? 14.How thick are the tiles. 1.What is the finish on the Mexican handmade wall tiles, matt or gloss? The handmade tiles are glossy in appearance. The intense orange, red, special blue and green have a white glaze with colour applied over the top. I would describe these colours as glossy and glassy. The tiles are not frost proof. If water gets into the glaze and freezes, it will expand and the glaze will eventually flake off, which is ok if the look you want is romantic decay. I have included a photo of some weathered tiles I saw in Mexico. Despite being in the Tropics the altitude means occasionally it freezes. You can, however, tile on an external house wall, as the heat emanating from the house would stop the tiles freezing. 3. Are the tiles suitable for using behind a cooker and a fireplace surround? The tiles are heat proof and are suitable for both tiling behind a cooker and around a fireplace. 4. Can the tiles be used in bathrooms, showers and kitchens? Yes this is fine as long as they are installing correctly. 5. Are the handmade wall tiles suitable to use on the floor? The wall tiles are not hard fired and they would start to crack under the pressure of footfall. They are manufactured as wall tiles. If you look at an individual Mexican tile in a certain light and angle, a maze of tiny cracks in the glaze is visible. It is more obvious in some colours than others. If you would like to visibly enhance the crackle then you can use a contrasting grout colour – for example, grey grout with Mexican white tiles. 7.What colours does the grout come in and where can I buy it? The grout comes im many different colours. Some suppliers such as Mapei have a colour chart. Grout can be bought in DIY and Decorating Shops as well as tile shops. 8.What grout would you recommend? The tiles are irregular in shape and size so you will need to use a wide joint grout such as Ardurit C11. 9.What are the differences between laying industrial tiles and handmade tiles? The tiles are hand made and have small irregularities in their shape and size. The tiles are often slightly cupped, so when you lay them, as well as spreading adhesive on the wall with a notched trowel, butter the back with a tab of adhesive. This ensures that there is a strong contact between the tile and the surface. We recommend leaving a 3 to 5mm grout gap. It is best to lay the tiles by eye. We use the cardboard from the box that the tiles come in to support the tiles as the adhesive dries. It is the perfect thickness. 10.How do I work out a random pattern for laying my Mexican tiles? Random patterns are the hardest to achieve and rarely look random. However, if you would like to create, say, a predominantly green pattern with splashes of blue, it is easiest to do this as a percentage – for example, 90% green and 10% blue. Apply these percentages to your tile quantities when you order. Lay out your pattern on the floor or a table before you start tiling to achieve the effect you want. 11.Why are different coloured Mexican tiles different prices? 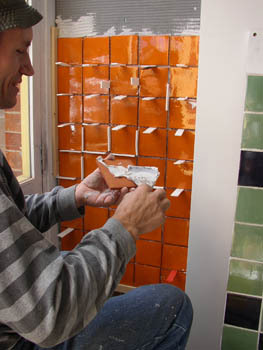 The price of the tiles is dependent on the colour of the glaze. Firstly, some glazes are more expensive to produce. Secondly, some colours are harder to achieve and therefore there is more waste and hence a higher price. 12.Can I collect the tiles? You can collect the tiles from our shop in London, which is open on Saturday from 12pm to 5pm & Sundays 9am to 5pm or by appointment any other day of the week. We have a warehouse in Bristol where the tiles can also be collected by appointment. The warehouse is open from Monday to Friday 9am to 4.30pm. We come and go from the warehouse so it is important that you make an appointment to see us. 13.Do you stock Mexican decorative handmade ceramic wall tiles? Yes we hold stock of all the tiles on the website. The tiles are 7mm thick approximately. The tiles are slightly convex and concave. When they are installed they have a pillowed effect.